Juno: Spacecraft gets a boost from Earth. Earth, from Juno. You can see the east coast of Argentina to the upper right. The Juno spacecraft was launched on August 2011, and it’s taking the long road to Jupiter. Weighing an impressive 3600 kilograms (8000 pounds) at launch, its Atlas V launch rocket couldn’t fling it directly to the King of the Planets. Instead, it has to be sneaky: It took a long elliptical flight outwards, past the orbit of Mars, then came back to Earth to steal some of our energy. This is called a gravity assist, or more colloquially (if less accurately) a slingshot maneuver. On Oct. 9, 2013 it practically took the whiskers off Earth, passing a mere 560 kilometers (350 miles) from our planet’s surface! Compare that to the Earth’s diameter of just under 13,000 km (8000 miles) and you’ll get an idea of how close this was. 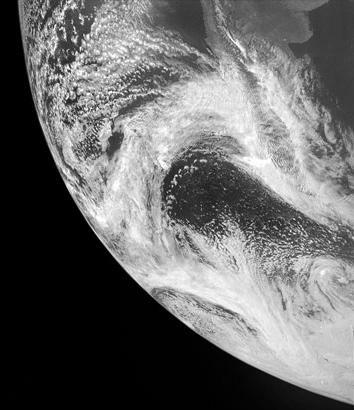 Earth, as seen by Juno as it whizzed past us on Oct. 9, 2013. Photo by NASA/MSSS, processed by volcanopele on the Unmanned Spaceflight forum. This is pretty impressive work on his part, given how fast Juno was traveling relative to the Earth. NASA websites are still down due to the government shutdown, but I found a cached NASA site that gave Juno’s speed as 138,000 km/hour relative to the Sun. Oddly, I found a site or two claiming this is the fastest human-made spacecraft in history, but the solar Helios probes were certainly moving faster than that relative to the Sun. Still, 138,000 km/hour (93,000 miles/hour) is fast enough to get from the Earth to the Moon in three hours. Holy yikes. To pick up this extra velocity, the spacecraft approached Earth from behind and used our planet’s gravity to tug the spacecraft along, accelerating it. That description cuts out a lot of physics, though; in the end, the way it actually works is that the probe steals a bit of the energy of Earth’s motion around the Sun. The energy exchange depends on the ratio of the masses of the Earth and Juno — a factor of a billion trillion — so the spacecraft gets a mighty kick, while the Earth slows only a teeny tiny bit in its yearly path. You could do this all day every day and the Earth would never notice, but the probe increased its velocity by 26,000 km/hour. The closer the probe gets to Earth, the more efficient the gravity assist is. That’s why Juno came so close to us. It’s amazing to think we can fling a spacecraft hundreds of millions of kilometers, only to rendezvous (briefly!) with its home planet and miss it by only a few hundred. We’re really, really good at this. The encounter was marred by one problem: Juno went into “safe mode” as it passed us. That means it detected some anomaly and put itself to sleep until engineers back home could figure out what’s what. Emily Lakdwalla from The Planetary Society talked to the Juno Project Manager, who gave some details. The good news is that on Friday (Oct. 11) Juno exited safe mode, and is awake once again. Since the gravity assist was passive — the spacecraft was just cruising with no rocket burns — it’s on the right path to Jupiter no matter what. So once again we have an extension of humanity on its way to the outer solar system. Next stop, Jupiter!